This Spectre Elite kit adds one more manifold to spectre. The front panel manifold still allows the installation of the front 360mm radiator with full ventilation around the outside of the manifold. Connections can be made above the front 360mm radiator, extra fittings are required. This manifold kit is mostly for aesthetics although the side manifold cleans up your loop and tube runs. ETA: 6 weeks until shipping. Vertical GPU Mount now included. 40% more fluid flow inside manifold. 60% less manifold fasteners for a cleaner manifold. Fully serviceable manifold (easy to dismantle and will not void warranty). Cable routing tweaks to improve cable routing for Core Components, Fans, Lighting. New ventilation design on front and top panels. Front I/O Removed. Power Button Only for a cleaner build. Streamlined 8pin EPS, 4pin ATX Cable Routing with more direct route. Smaller more streamlined rear cable cover. 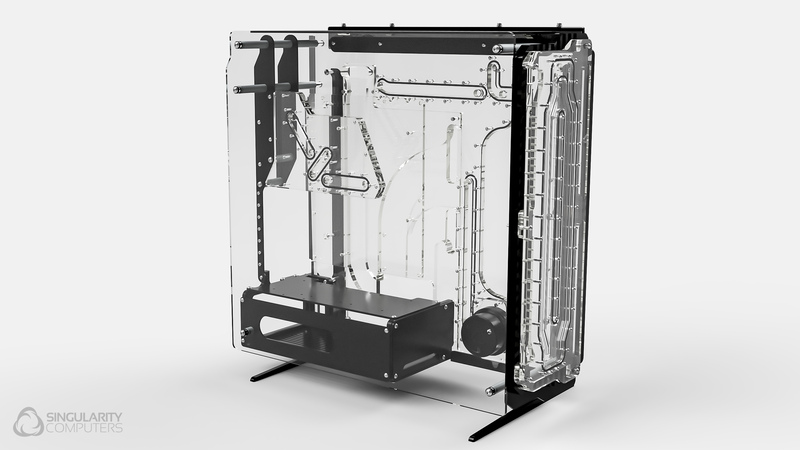 Spectre Elite Kit add-on now available, adding two more manifolds. 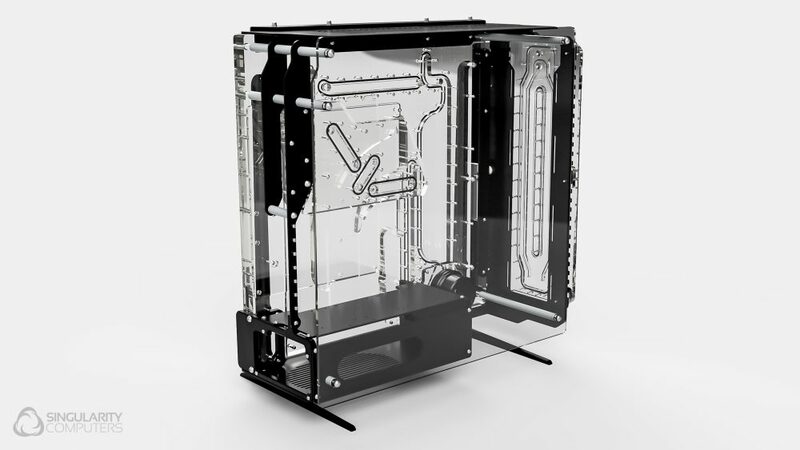 The first commercially available case with an integrated manifold, designed exclusively for liquid cooling. Significant cost savings due to integration of the reservoir, pump top, pump cover & roughly half of the liquid cooling loop. Close to half of liquid cooling component costs are saved in an ideal scenario. Modder friendly, no rivets, low component count, easy to assemble and dissasemble. Easy to paint and modify aluminium components. 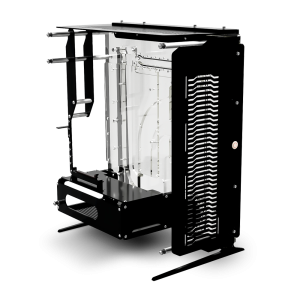 Large radiator capacity, double that of the typical mid-tower case. 2x 360mm radiators 60mm thickness and thicker is possible. Designed for maximum compatibility with a wide range of liquid cooling components. Made in the USA. Minimal components from overseas. Flat packs down to slightly larger than the size of the manifold. 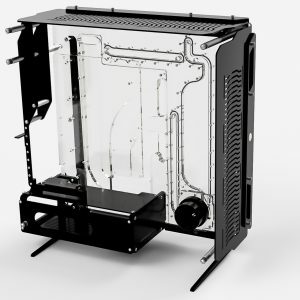 Large radiator capacity in a mid tower case. Up 60mm thick radiators. 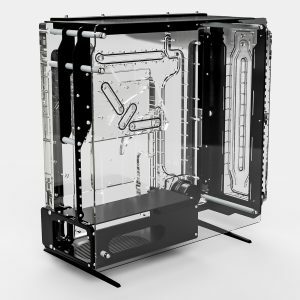 Two 360mm radiators, one front panel, one top panel. Checkout Spectre Gallery for more photos & Spectre Features for more videos If you have any questions, feel free to ask us by using the "Questions & Answers" form below. More information and photos will be available in the coming weeks.